Chronic obstructive pulmonary disease (COPD) is a disease of the lungs, characterized by a limitation of the airflow in the airways – partly or completely irreversible. The is due to inflammation of the pulmonary tissue (parenchyma) caused by the inhalation of gases and particles. COPD includes two major components – chronic bronchitis and pulmonary emphysema. Chronic bronchitis is defined as inflammation in the airways, resulting in a cough and phlegm, lasting no less than 3 months in two consecutive years. In chronic bronchitis, a restructuring of the wall of the airways occurs, resulting in a narrowing of the bronchial lumen. This leads to a permanent restriction of the air flow. Pulmonary emphysema is a permanent extension of the alveoli as a result of the destruction of the elastic fibers in their walls. It causes a collapse of the small airways, as a result of which the function of the lungs is disturbed. COPD patients are mostly men over 40 years old, smokers. The course of COPD is with phases of exacerbation and improvement of the condition of the patient. The symptoms of COPD include a cough, shortness of breath, hiss, pain and tightness in the chest, reduced physical capacity, wheezing. With the progressing of the disease, signs of respiratory failure appear – mucosal bruising (cyanosis), drowsiness during the day and insomnia at night, headache, confusion, etc. Diagnosis is made by a physician based on a detailed history, examination, and confirmation of airway obstruction with spirometry. Radical treatment does not exist. There is only control over the symptoms of the disease. The key point in treatment is the cessation of smoking. The cough should not be inhibited by medication because it is a protective mechanism. Upon exacerbation of the condition, medicines are added, including secretagogues, anti-asthma drugs, bronchodilators, antibiotics, anti-inflammatory drugs, corticosteroids, pulmonary rehabilitation. Lung volume reduction surgery and lung transplantation can be necessary in case of emphysema. Congestive heart failure (CHF) is a clinical syndrome of easy fatigue, shortness of breath, limited physical capacity, pulmonary and/or systemic stagnation due to the inability of the heart to pump and/or to take enough blood to satisfy the metabolic needs of the tissues. In CHF the pumping power of the heart is weaker than usual – the blood moves through the heart and the body slower, and the pressure in the heart rises. As a result, the heart is not able to transport enough nutrients and oxygen to meet the body’s needs. The valves respond with stretching to hold more blood for pumping or become hardened and stiffer. This helps for a while, but over time the heart muscle and walls become weaker and unable to pump the blood with the necessary strength. As a result, the kidneys often react by causing the body to retain sodium and fluids. Decompensation occurs in the venous system. The symptoms of CHF include superficial and rapid breathing, nighttime shortness of breath, irritating dry cough, pink sputum, palpitations, cyanosis of the lips, sweating, cold and pale skin, anxiety, etc. Other diseases – kidney disease, liver disease, non-cardiac surgery, trauma, poisoning, prostate obstruction, etc. Total heart failure – both chambers are affected. The CHF is diagnosed by physical and instrumental examinations, including heart and lung auscultation, echocardiography, electrocardiography, radiography of the lungs, gas analysis of the blood. Improve the myocardial contractility, control and correction of the ventricular frequency, etc. COPD: COPD is a disease of the lungs, characterized by a limitation of the airflow in the airways – partly or completely irreversible. CHF: CHF is a clinical syndrome of easy fatigue, shortness of breath, limited physical capacity, pulmonary and/or systemic stagnation due to the inability of the heart to pump and/or to take enough blood to satisfy the metabolic needs of the tissues. 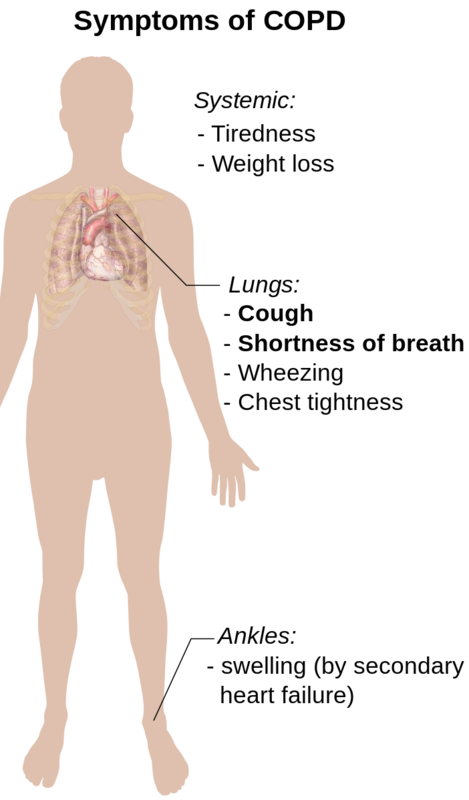 COPD: COPD includes two major components – chronic bronchitis and pulmonary emphysema. CHF: Depending on the affected ventricle CHF can be left-side heart failure, right heart failure, and total heart failure. COPD: The main risk factor causing COPD is smoking. Other risk factors are polluted air, frequent respiratory infections, intensive and prolonged exposure to harmful substances, hereditary deficiency of alpha-1-antitrypsin, gender, age, etc. CHF: CHF can be caused by coronary disease, heart attack, cardiomyopathy. Provoking factors are increased stress, increased intake of sodium and fluids, pulmonary thromboembolism, heart, systemic, and pulmonary infections, exacerbation of ischemic heart disease, the onset or worsening of valvular regurgitation, other diseases. COPD: The symptoms of COPD include a cough, shortness of breath, hiss, pain and tightness in the chest, reduced physical capacity, wheezing. With the progressing of the disease, signs of respiratory failure appear – mucosal bruising, drowsiness during the day and insomnia at night, headache, confusion, etc. CHF: The symptoms of CHF include superficial and rapid breathing, nighttime shortness of breath, irritating dry cough, pink sputum, palpitations, cyanosis of the lips, sweating, cold and pale skin, anxiety, etc. COPD: Diagnosis is made by a physician based on a detailed history, examination, and confirmation of airway obstruction with spirometry. CHF: Diagnosis is made by a physician based on a detailed history, heart and lung auscultation, echocardiography, electrocardiography, radiography of the lungs, gas analysis of the blood. COPD: The main groups of medications that are used to treat COPD are secretagogues, anti-asthma drugs, bronchodilators, antibiotics, anti-inflammatory drugs, corticosteroids. 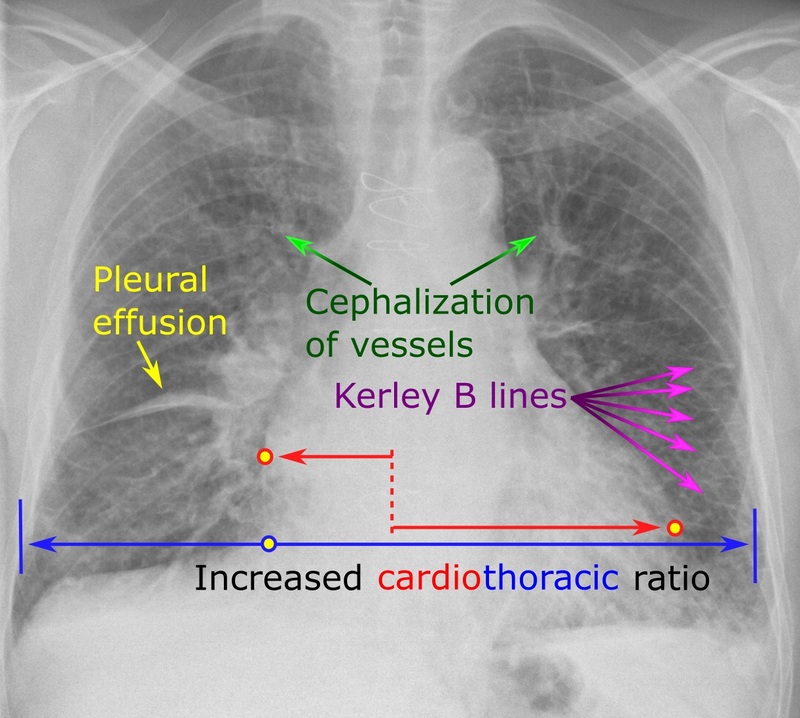 Lung volume reduction surgery and lung transplantation can be necessary in case of emphysema. CHF: The main groups of medications that are used to treat CHF are ACE inhibitors, beta blockers, diuretics, cardiac glycosides, vasodilators – nitrates, etc. COPD is a disease of the lungs, characterized by a limitation of the airflow in the airways – partly or completely irreversible. CHF is a clinical syndrome of easy fatigue, shortness of breath, limited physical capacity, pulmonary and/or systemic stagnation due to the inability of the heart to pump and/or to take enough blood to satisfy the metabolic needs of the tissues. COPD includes two major components – chronic bronchitis and pulmonary emphysema. CHF can be left-side heart failure, right heart failure, and total heart failure. The main risk factors causing COPD are smoking, polluted air, frequent respiratory infections, intensive and prolonged exposure to harmful substances, hereditary deficiency of alpha-1-antitrypsin, gender, age, etc. CHF can be caused by coronary disease, heart attack, cardiomyopathy, increased stress, increased intake of sodium and fluids, pulmonary thromboembolism, heart, systemic, and pulmonary infections, other diseases. The symptoms of COPD include a cough, shortness of breath, hiss, pain and tightness in the chest, reduced physical capacity, wheezing. With the progressing of the disease, signs of respiratory failure appear. The symptoms of CHF include superficial and rapid breathing, nighttime shortness of breath, irritating dry cough, pink sputum, palpitations, cyanosis of the lips, sweating, cold and pale skin, anxiety, etc. Diagnosis of COPD is made based on a detailed history, examination, and confirmation of airway obstruction with spirometry. Diagnosis of CHF is made based on a detailed history, heart and lung auscultation, echocardiography, electrocardiography, radiography of the lungs, gas analysis of the blood. The main groups of medications that are used to treat COPD are secretagogues, anti-asthma drugs, bronchodilators, antibiotics, anti-inflammatory drugs, corticosteroids. Lung volume reduction surgery and lung transplantation can be necessary in case of emphysema. The main groups of medications that are used to treat CHF are ACE inhibitors, beta blockers, diuretics, cardiac glycosides, vasodilators – nitrates, etc. Dr. Mariam Bozhilova Forest Research Institute, BAS. "Difference Between COPD and CHF." DifferenceBetween.net. December 3, 2018 < http://www.differencebetween.net/science/health/difference-between-copd-and-chf/ >. Haas, F., S. Haas, R. Human. The Chronic Bronchitis and Emphysema Handbook. 1st Edition. New York, Toronto: John Wiley and Sons, Inc. 2000. Print. Mann, D., D. Zipes, P. Libby, R. Bonow. Braunwald's Heart Disease: A Textbook of Cardiovascular Medicine. 10th Edition. Philadelphia: Elsevier Saunders. 2014. Print.